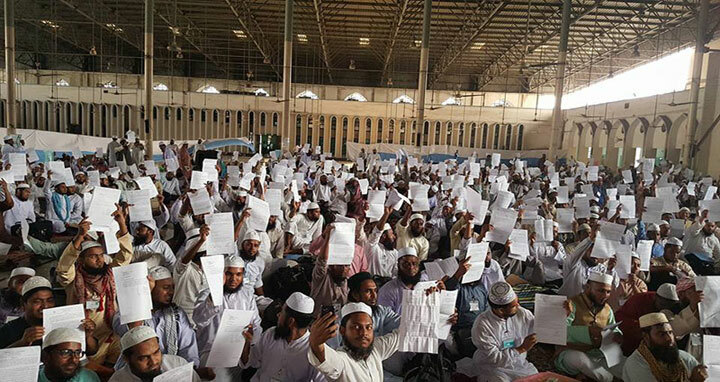 Dhaka, 5 Mar, Abnews: A total of 1,010 Qawmi madrasa graduates have joined the government service for the first time on Monday as the Qawmi madrasa certificates got government recognition. According to an Islamic Foundation (IF) release, they will join as teachers of the Qawmi Faculty at Darul Arkam Ibtedaye Madrasha under a project titled "Mosque Based Children and Mass Education Program (6th phase) being implemented by Islamic Foundation. After the joining, a three-day orientation training workshop for them will be held. Religious affairs minister Principal Matiur Rahman inaugurated the workshop at Baitul Mukarram National Mosque East square at 2.30pm on Monday. Chairman of the parliamentary standing committee on CHT affairs ministry RAM Ubaydul Muktadir Chowdhury, religious secretary M Anisur Rahman, religious affairs secretary of the ruling Awami League Sheikh Mohammad Abdullah and governor of the Islamic Foundation's Board of Governors Misbahur Rahman Chowdhury among others were present. Director General of the Islamic Foundation Shamim Mohammad Afzal presided over the function.